At Rolling T Stores we have sold a product called Bigeloil Liquid Gel which is a topical pain relief gel. It is labeled for horses and dogs; however, the majority of the sales are to people for themselves. Now we have Two Old Goats Arthritis & Fibromyalgia Essential Lotion for people that is a lotion which is not greasy, doesn’t give you the unusual sensation with other products of this type, and it doesn’t have an offensive odor. I have personally used this on my neck which aches from the computer work that I do daily. This is a nice relief for me! 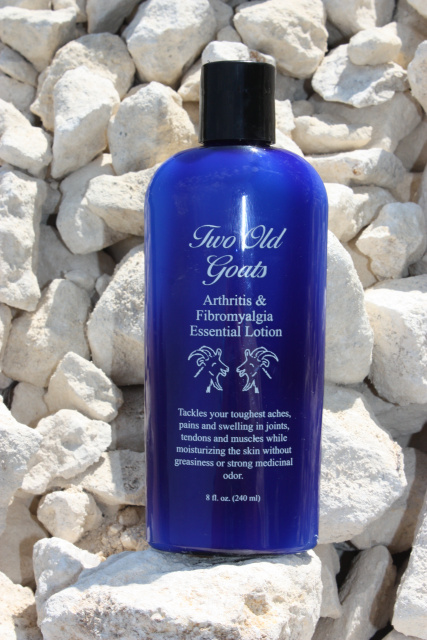 Two Old Goats Arthritis & Fibromyalgia Essential Lotion is their strongest formula, ready to tackle your toughest aches & pains caused by swelling due to Arthritis, Fibromyalgia, Gout or Injury. The goat’s milk base carries a natural blend of 6 Essential Oils deep into your joints and muscles. German Chamomile, Lavender, Rosemary, Peppermint, Eucalyptus and Birch Bark work together as both an anti-inflammatory and an analgesic. Begin feeling relief instantly, while daily applications have a cumulative effect. Finally, pain management you CAN FEEL GOOD ABOUT, with a delicate scent, not a strong unpleasant medicinal odor. I was skeptical but decided to try it anyway. I don't know how it works, but it really does! I have some arthritis in my knee and a tennis elbow and it helped both. And it smells pretty good -- not medicinal. I am using Two Old Goats for my legs and shoulders and love it . It is true to start working as soon as you apply it to you ache. Does it come in a roll on? Not that I know of; there is a foot balm and soap which is different than the lotion.